1) Welcome, Linda! It's a pleasure to interview you a second time. 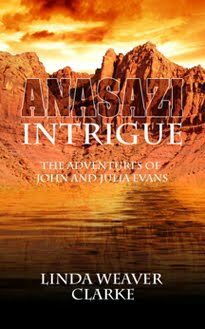 Please tell us about your new book, Anasazi Intrigue: The Adventures of John and Julia Evans. LWC: It's about a devastating flood that takes out several homes in a small town, the importance of preserving ancient artifacts, and a few puzzling and mysterious events. Julia is a reporter, and when she finds out about a possible poison spill that kills some fish and neighbors' pets, she has a feeling that something isn't quite right. Before she realizes what is happening, Julia finds out that this incident is much bigger and more dangerous than she thought. With dead fish, a devastating flood, and miscreants chasing John and Julia, they have their hands full. 2) I'm always interested to discover the story behind the story. Where did the inspiration for Anasazi Intrigue come from? LWC: It came from a true experience that really happened right here in my little valley in southern Utah. The Santa Clara/Virgin River flood in 2005 was a terrible disaster. About two hundred homes were seriously damaged and twenty-five were completely destroyed. The small five-foot-wide river, which could easily be crossed on foot or in a car, grew as wide as the length of a football field, and it was taking everything in its path. In three days time, it had dug into the earth's surface, carving away at the banks, creating ridges as high as forty feet deep. In fact, the river was moving at ten feet per hour, just like a plow pushing the dirt and trees down the river. Everyone worked hard to help the residents remove what they could from their homes before the flood hit, but there were those who escaped with only the clothes on their backs. The experience of charity and compassion by the people was incredible. There was no prejudice of religion, race, culture, or status, just unconditional love and concern for everyone. Homes, clothes, and food were instantly found for the homeless. We all gathered together and tried to help in any way possible. Several weeks later, a man found his car thirty miles downstream from his home. It was amazing that he could find it. 3) What type of research goes into creating one of your mystery novels? LWC: First, I find a subject that interests me. For example, with Anasazi Intrigue, I was interested in the Anasazi Indians right here in my valley. Who were they, where did they come from, how did they live? Many people wonder why they disappeared, leaving behind their belongings and valuables. Where did they go and why? There is much speculation about what might have happened. Some archaeologists believe that discord and tribal violence caused abandonment of the villages. In my research, I found that archaeological thievery is becoming more and more of a problem every year. When an ancient ruin is discovered, it doesn't take long for thieves to find out about it. Did you know that an ancient funereal pit can be sold for $60,000 on the black market? Not to mention all the pottery, baskets, and pendants found by looters. It's a very intriguing subject and I enjoyed learning so much in my research. I read an article in the Las Vegas Sun newspaper about a couple of men who were loading some artifacts in the trunk of their car. A ranger saw what they were doing and questioned them, not realizing he had accidentally stumbled upon the largest operation around. The article said that they recovered more than 11,100 relics. Did you know that looting is only second to selling illegal drugs? This is how I do my research and then I include what I've learned. 4) How does writing a mystery compare with writing historical fiction? What are the main differences, and what do these forms of writing have in common? LWC: Great question! I have enjoyed writing historical romance but I've now turned to mystery. The whole process and concept of writing a mystery is so completely different than writing historical romance. While writing historical fiction, I research that time period and add historical events, newspaper articles from that time period, etc. as the plot thickens. With romance, you know that the hero and heroine are going to get together, but how? As you write, you develop some sort of charisma between the characters, making the reader feel excited that one day they're going to hit it off and fall in love. With mystery, it's totally different. You have to plan out the mystery, you may or may not allow your reader to know who the bad guys are, according to the plot. Do you know the difference between a mystery and a mystery suspense novel? In a mystery, when a knock is heard at the door, the reader doesn't know who's behind it. With mystery suspense, the reader knows who's behind the door and yells to the heroine, "Don't open the door." What do these forms of writing have in common? Well, if you mean how do I plan out my books, there is one thing they have in common. I write down all the conflicts and mysteries behind the scenes of both genre. I don't always use everything that I list and my characters seem to go in different directions than I had planned originally, but I do have a list. Ha, ha! 5) Who is your favorite mystery writer? LWC: Betsy Brannon Green. 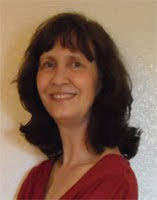 I not only love her mysteries but she even wrote a foreword for my second book, Edith and the Mysterious Stranger. She also wrote some blurbs for Melinda and the Wild West and for Jenny's Dream. She's a busy author because she has 15 books out. 6) Tell us one surprising thing about your experience writing this book, or about something else related to your career as a writer. LWC: It was very difficult planning out the mystery novels. I wanted it to be a mystery to my readers but I was worried that it would be too easy to figure out. That has been a difficult part for me. I usually don't read my novels to my husband until they're published. But I was so worried that my mysteries would be too obvious, so I read each one to my husband to see if he could figure it out. He was my guinea pig, so to speak. 7) What do you hope your readers get out of your books? LWC: Entertainment and a little education! My goal is to uplift others and bring a little joy into their lives. If I can make someone laugh or fall in love all over again, then it's worth being an author. To read an excerpt from each of my books, visit these sample chapters. 8) Is another novel in the works? LWC: Oh yes! In this mystery series, there are three books that deal with similar subjects. I have always been intrigued with the Mayan culture. Who were they and why did they abandon such magnificent structures in Mexico? The mysteries of the Mayan people have intrigued archaeologists for many years. Mayan Intrigue is about the discovery of a priceless artifact, which puts Julia's life in great danger. From valuable artifacts to shady businessmen, the Yucatan Peninsula becomes a dangerous vacation spot for John and Julia Evans. While on assignment for the newspaper, the Evans try to enjoy a romantic vacation among the Mayan ruins, but when Julia accidentally comes upon a couple of suspicious men exchanging an item, she quickly turns and leaves but it is too late. The men have seen her. As a reporter, Julia does not easily give up and her curiosity gets them in a mess of trouble. Before John and Julia realize what is going on, they are both in danger and find themselves running for their lives through the jungles of the Yucatan. Mayan Intrigue is now with the printer and will be released in three months. At this time, I'm getting ready to send book number three, Montezuma Intrigue, to my publisher. I'm hoping for the same editor because I really like her but one never knows who they'll assign. Thank you, Linda! I enjoyed learning more about the mystery writing process, and about your new book. I had no idea that the looting of ancient ruins was such a problem, or that there's a black market for ancient funereal pits and assorted artifacts. To celebrate the publication of her new book, Linda Weaver Clarke is generously offering an autographed copy of Anasazi Intrigue as a giveaway (U.S./Canada only). To enter this giveaway, read the first chapter of Anasazi Intrigue, then return here and leave a comment about your favorite part of the chapter, or about what first grabbed your interest while reading the excerpt. The chapter is short and should only take a few minutes to read. For an extra chance at winning, become a follower of this blog, or let me know that you're already a follower. Enter by 5 PM PDT on Thursday, April 29. The winner will be chosen randomly and announced on Friday, April 30. Good luck! Ohhh the fish! I'm curious to know what happened to the fish . Very intriguing. I like the fact that she is writing about things that are close to home to her. Especially that she has experienced a flood similar to it, this really gives it a realism. How very interesting that her story is based on a real life and incredible event! Very nice interview Suko! I am so glad that Linda was able to share all of this with us! Nice interview! I cannot imagine how awful it would be to experience a flood like that. The thought of losing the memories of a lifetime in the opening paragraph really caught me. It wasn't the fish that most make me want to read more but the dream pendant. I want to know more about that & the man who was watching her. I'd love to be entered into this one. I also blogged about this. Linda, you are so romantic! Drama, critical life scene, mysterious man, dead fish, and mushy talk! Great reading. I like having our local names in your story. Now I need to know more about the man with the pony tail. I bet he can reveal the mystery of the fish! I want to find out more about 'the man in white'. Thank you for this contest! I am now a new follower via google reader! This sounds like a great book. I really love mysteries and I am interested in the research aspect of the book too. Great interview! What great info for wanna be authors. Please enter me in the contest. I had to giggle, because this is the chapter you mentioned at your recent Laughlin lecture, where you called your main character Julia Roberts at the beginning, but several paragraphs later you identify her as Julia Evans. What a great lecture. Thank you, Linda. The spellbinding action you begin with gets the reader right into the story. John and Julia's love and respect for each other keep it going. I'm already subscribed to your blog, and look forward to receiving them. Thanks, Cheryl. It was a fun lecture. And yes, I was able to use my little mistake to my advantage because I quickly thought how I could use it in another mystery that concerns the name Roberts. I can't tell you what it is but it's in book #3: Montezuma Intrigue. I haven't even told my husband what I did so I could surprise him with a "surprise ending." Actually, Connie, Roberts is her middle name. At first it was an accident because my last book had Melinda Roberts. But when I noticed the mistake, instead of changing it, I instantly saw another plot for my next book. In Mayan Intrigue, she begins to wonder why she had been given such an unusual middle name. So my mistake turned into an interesting plot for Montezuma Intrigue. Nice blog!! I really enjoyed the interview, it is so nice to read about how an author actually sets about writing something. Will come back for more! Great interview! Ah, if I only had the patience to write a novel...the opening of this one really grabbed me! Thank you all for the comments, posts, and tweets. There were 3 things that caught my attention. 1. The man in white, who is he? 2. Her dream of stealing a necklace, why? 3. The dead fish, what or why? Great interview. I enjoy learning more about the author and how, when, where, etc that they came up with the story line. Great interview! No need to enter me, but I added the giveaway to my sidebar. This is so intriguing already! I just love the witty banter between the husband and wife. I love a little romance sprinkled in my mystery! !